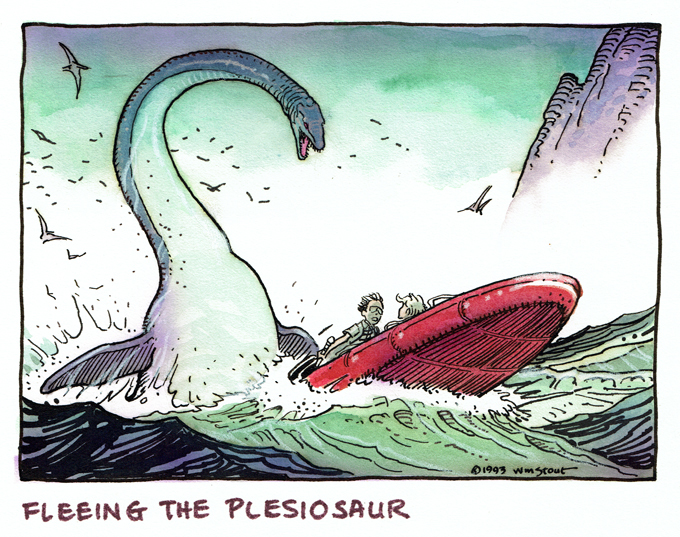 Continuing my series of sales for the original art I created for a proposed Jurassic Park animated series commissioned by Universal Cartoon Studios is my idea for a scene from the series showing Tim and Lex fleeing from a plesiosaur in an inflatable boat. Ink and watercolor on board. Image size: 5″ x 7″. It’s for sale in the “Original Art” section in my website’s Bazaar. This entry was posted on Wednesday, August 12th, 2015 at 9:20 am	and is filed under Misc.. You can follow any responses to this entry through the RSS 2.0 feed. You can leave a response, or trackback from your own site. You just keep topping yourself, don’t you! Thanks, Rick! This was a fun gig.